What Types of Addiction Recovery Are Available? Morphine addiction can lead to serious health problems. Recovering from dependency requires professional treatment to ensure a safe and long-lasting sobriety. Which type of drug rehab program is right for you? How much does the recovery center cost, and how will you pay for it? What are the other features of the program: how qualified are the staff, where is the program located and does it offer specialized treatment? Which treatment type is the right fit for your teen? Who Answers? if you have questions about how to pay for morphine rehab or using insurance to cover recovery costs. People use morphine non-medically for its euphoric effects. Some forms of morphine can be taken orally and rectally in addition to the more common injectable routes (intravenously, intramuscular and subcutaneous). This makes it a more approachable alternative to heroin for many people. When a person abuses morphine, a dependency can be quick to follow, leading to increased risk of dangerous side effects. A person abusing morphine should seek substance abuse treatment right away to safely remove this drug from their body and lifestyle. An increased tolerance to the drug and increased drug use to overcome it. Emotional or physical dependence on the drug. A lack of engaging in activities that used to be pleasurable. Withdrawal symptoms occurring when the drug is not taken. Many factors affect the cost of a morphine rehab program. Morphine treatment costs will differ depending on the program. Outpatient programs generally cost less than inpatient programs. Shorter treatment plans cost less than longer ones. Programs in the countryside will typically cost less than ones in a city. Insurance coverage will also vary according to your plan. Government-organized insurance plans such as Medicaid, Medicare and any of the healthcare marketplace plans will cover varying amounts toward treatment, depending on which state you are in. Most will cover substance abuse screening and some portions of treatment. Fortunately, the Affordable Care Act makes sure that insurance companies cover substance abuse treatment to the same degree that they cover other medical health treatment. If you have private insurance, call 1-888-319-2606 Who Answers? to ask about your coverage. If you do not have insurance, check out the health insurance exchange for affordable plans that can be priced according to your income. Payment plans. Set up a long-term payment plan with the treatment program so you can pay over time rather than all at once. Sliding scale. Find a program that offers a sliding scale payment system, where costs will be dependent on your income. Finance treatment. Use other financing options such as credit cards and different types of loans. Rehab scholarships. Scholarships offered by the programs themselves can cover part or all of the cost of treatment. Because people who abuse morphine come from all walks of life, there is no one-size-fits-all approach to treatment. Choosing a program that fits your needs will offer you the best chance for a successful recovery process. Evaluation by a professional familiar with the addiction treatment process can prove invaluable in helping you make the right selection for a specific treatment type. Inpatient or residential morphine addiction treatment involves staying at a treatment facility for an extended period of time. This type of treatment is best for more severe cases of addiction or for those who have relapsed before. It allows you to work on recovery in an entirely drug-free place. Residential programs. You stay at the facility for a predetermined amount of time. 30-day stays are appropriate for those in the earlier stages of abuse. 60-day stays allow the recovering user to develop better coping skills and stronger sober relationships to prevent relapse. 90-day stays are the best for people suffering from severe addiction. Luxury programs. These rehabilitation programs are similar to residential ones. But they focus much more on comfort and offer more luxurious amenities. Executive programs. Executive or CEO programs follow the luxurious focus on comfort and amenities. But they allow you full access to things that will allow you to work from the facility: Internet connection, conference rooms and work spaces. Outpatient morphine treatment involves working through treatment and recovery while continuing to live at home. This type of program may be reserved for those with a strong support network at home or for less severe cases of addiction because you will remain in the original abuse environment. This can be risky for cases of extreme dependency. Intensive programs follow a rigid recovery process to account for the lack of a sober living environment. Programs include including therapy, education, abstinence checks, crisis help, support groups and vocational training. Partial hospitalization involves checking in at a treatment center multiple times a week for medical monitoring and therapy (both group and individual). Counseling and therapy in both a group and individual setting offer continual support for a recovering user to develop relapse prevention skills. Often, substance abuse problems such as morphine addiction come with other mental health issues such as depression, anxiety, or bipolar disorder. These issues may be part of the reason a person began using in the first place. This is known as dual diagnosis, and it requires special treatment to address all of the difficulties that come with the struggle to fight both addiction and mental health problems. Morphine abuse in particular has been associated with a number of mental health disorders. The type of treatment and length of time for recovery will vary from person to person. But here’s a quick overview of the basics of morphine addiction treatment. You will meet with a doctor to determine the best course of treatment and to set up a treatment plan. You must get rid of all the morphine in your body to start your treatment, which can lead to uncomfortable withdrawal symptoms. Morphine withdrawal symptoms are often described as “flu-like,” with sweating, body aches and gastrointestinal disturbances being quite common. While they are not life-threatening, medical monitoring can help alleviate detox discomfort. Different types of therapy will help you address morphine abuse from different viewpoints. Cognitive behavioral therapy will lead you through the root causes of your addiction and help you practice coping skills for future temptations. Motivational interviewing will help you find your own motivations for remaining abstinent and keep you on a goal-oriented recovery path. Family or couples therapy will engage your loved ones with your recovery, even addressing issues in your home life that may be affecting your morphine habits. It is not uncommon to suffer from morphine addiction and mental health issues. If you are struggling with both challenges, your treatment should address both problems to be the most effective. Look at the location, staff, family involvement and whether the treatment is individualized. Many factors can impact your treatment program selection and how well the program will work for you. Location: Do you want to stay close to home or travel away from where you were using? Staff qualifications: Is the staff certified for substance abuse treatment? Do they have experience with your specific addiction, or similar ones? Family involvement: Do you want your family involved in your treatment or do you want to escape family life during recovery? Individualized care: Does the program specialize in morphine or prescription drug abuse treatment? Do you need special treatment for a dual diagnosis? Drug rehab facilities for teens follow a similar course as those for adults. But the network of peers is composed entirely of recovering users in the same adolescent age range. This can make struggling teens much more comfortable than coping with drug cravings among a much older crowd. Inpatient and outpatient treatment among fellow adolescents. 12-step programs with membership limited to the teen age range. Nature-based therapy programs where the teen spends time in a natural setting for treatment among their peers, providing an escape from home stressors and family issues that may have contributed to the drug abuse. 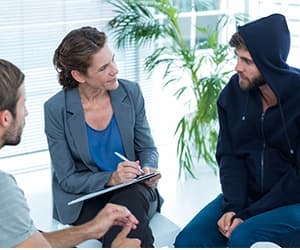 Therapy in teen addiction recovery programs focuses much more on family relationships and resolving any conflicts that the recovering adolescent may have in their home life. There is more family involvement in the treatment of adolescent morphine abuse because the home environment is such a major part of an adolescents life. Coping with conflict among friends or family. When looking for a treatment program for a teen with morphine addiction problems, make sure to ask about the family involvement in treatment as well as the programs experience with dual diagnosis conditions. Many teens struggle with mental health issues. Morphine abuse can lead to serious mental and physical problems. If you think you or someone you love has a problem with morphine, call 1-888-319-2606 Who Answers? right now to speak with a treatment support specialist about getting into a recovery program today.
. Kissin, W., McLeod, C., & McKay, J. (2003). The longitudinal relationship between self-help group attendance and course of recovery. Evaluation and Program Planning, 26. 311-323.
. Schwarz, J. M., & Bilbo, S. D. (2013). Adolescent morphine exposure affects long-term microglial function and later-life relapse liability in a model of addiction. Journal of Neuroscience, 33 3. 961-971.
. White, D. A., & Holtzman, S. G. (2005). Periadolescent morphine exposure alters subsequent behavioral sensitivity to morphine in adult rats. European Journal of Pharmacology, 528 1-3. 119-123.